Radio map of the Milky Way obtained by FUGIN project. Top: Three color (false color) radio map of the Milky Way (l=10-50 deg) obtained by the FUGIN Project. Red, green, and blue represent the radio intensities of 12CO, 13CO, and C18O, respectively. Second Line: Infrared image of the same region obtained by the Spitzer Space Telescope. Red, green, and blue represent the intensities of 24μm, 8μm, and 5.8μm radio waves respectively. Top Zoom-In: Three color radio map of the Milky Way (l=12-22 deg) obtained by the FUGIN Project. The colors are the same as the top image. Lower-Left Zoom-In: Enlarged view of the W51 region. The colors are the same as the top image.Lower-Right Zoom-In: Enlarged view of the M17 region. The colors are the same as the top image. Astronomers have conducted a large-scale survey of the invisible Milky Way using the Nobeyama 45-m Radio Telescope. 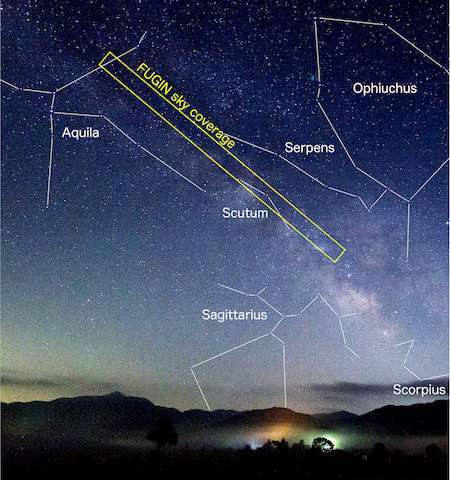 When you look up on a clear, dark night, you can see the Milky Way with the naked eye. If you shoot a photograph of the Milky Way, you will find some dark patches with fewer stars. In these areas, clouds of gas and dust in the Milky Way block the light from background stars. By observing the radio waves emitted by the gas in these clouds, astronomers can study the invisible portions of the Milky Way. A multi-institutional research group used the 45-m telescope from 2014 to 2017 to create the most extensive and detailed radio maps of the Milky Way in human history. The team has completed maps covering an area as wide as 520 full moons with about three times the spatial resolution of previous maps. This map will enable astronomers to study the structure of the interstellar medium from the large-scale structure of the entire Milky Way to the small-scale structure of individual molecular cloud cores directly related to star formation. Thanks to the good spatial resolution of the 45-m telescope, the team discovered many filamentary structures which were not seen clearly in previous maps. These structures are thought to hold important clues to understanding how stars are formed. This radio map will serve as a fundamental data set for future observational studies. The researchers expect many discoveries by researchers around the world based on this map. The Milky Way is a conglomeration of many stars. In the dark areas with fewer stars, gas and dust obscure the light from background stars. We call these areas dark clouds. The gas in the dark clouds cannot be seen in visible light, but can be observed in radio waves. A large telescope has good spatial resolution but can cover only a small portion of the sky. On the other hand, a small telescope can cover a wide area but has poor spatial resolution and cannot see the detailed structure of celestial bodies. For this reason, it is difficult to obtain observational data which simultaneously captures both the large-scale structure of the Milky Way and the small-scale structure of molecular cloud cores, which are related to star formation. With previous data, it was challenging to study the evolution of molecular gas, the material for stars. Especially to understand how and where stars are formed, a data set with wide coverage and high spatial resolution was desired. 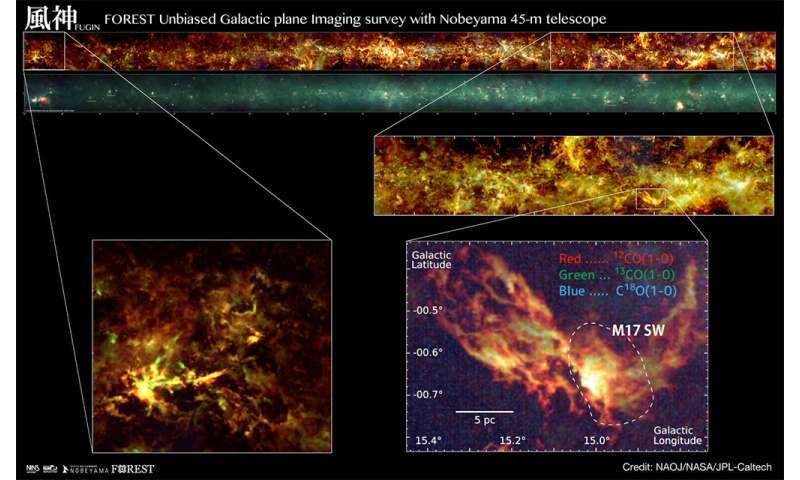 FUGIN (FOREST unbiased galactic plane imaging survey with the Nobeyama 45-m telescope) is a project to create an extensive wide-field radio map of the Milky Way with unprecedented high spatial resolution. The Nobeyama 45-m Radio Telescope has good spatial resolution, and the new FOREST receiver installed on the telescope enables astronomers to observe 10 times more efficiently than before. FUGIN was approved as one of the Nobeyama Radio Observatory legacy projects to get maximum use out of these advantages. The purpose of the legacy projects is to collect fundamental data for next-generation studies. FUGIN observed for 1,100 hours from 2014 to 2017. The observed areas covered 130 square degrees: about 83 percent of the area between galactic latitudes -1 and +1 degrees and galactic longitudes from 10 to 50 degrees and from 198 to 236 degrees. The angular resolution is about 20 arcseconds, and the radial velocity resolution for molecules is 1.3 km/s. This is about 3 times higher in spatial resolution than previous data for the Milky Way. The 45-m telescope simultaneously obtained data for 3 different isotope species of carbon monoxide molecules, 12CO, 13CO, and C18O. This enabled the researchers to study the physical characteristics of the gas, such as temperature and density, in addition to the distribution of the molecular gas and its motions. Analysis of the data from galactic longitudes from 12 to 22 degrees yielded the discovery of previously indistinguishable giant molecular filaments. Many filamentary structures were identified around star-forming regions such as M17 and W51. These structures could hold clues to understanding how a molecular cloud contracts to form stars. The radio map obtained with this project will be released in June 2018. The map will be a fundamental dataset for future studies of the Milky Way; it will be useful not only for observations using ALMA and other radio telescopes, but also for observations in infrared and other wavelengths. This result appeared in the Publications of the Astronomical Society of Japan in October 2017. This is almost a FUGIN waste of time being the FUGIN plasma ignoramuses don't have a FUGIN clue regarding plasma physics.